How can there be this many "mediums"? Finding a shirt that's the right size can be frustrating because there are so many factors to consider—shoulders, sleeves, torso and length. But all that work is worth it when you find that winning fit. Need a shirt that fits you just so? No need to go custom. Read on for tips to ensure the best fit. Stick a finger or two between your neck and the collar. 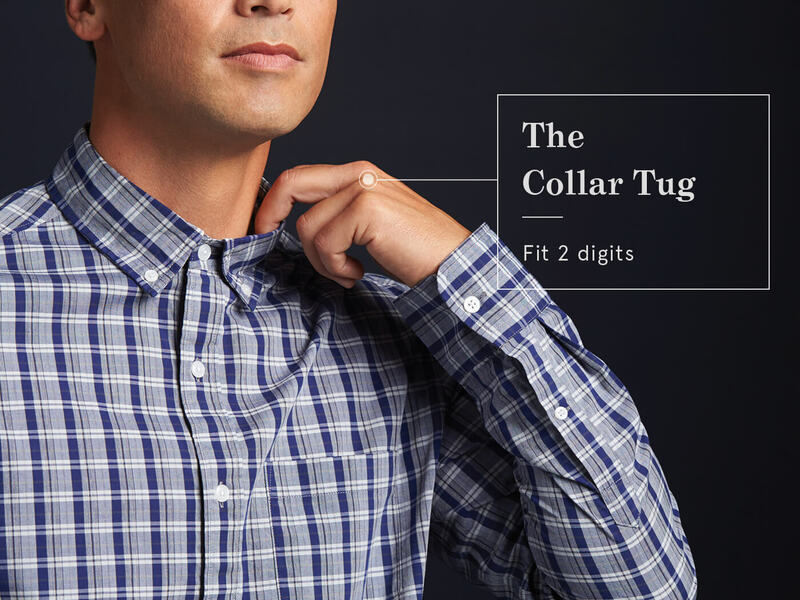 Our Stylists say if you can comfortably fit more than one finger in-between the collar and your neck, it’s too big. Others insist you can have room for two, but no more. But ideally, there should be no noticeable gaps when you’re fully buttoned. Check your shoulder seams to ensure they line up with the edge of your shoulders. The seam will fall on your arm (along the tricep) if it’s too big. If it falls higher on your shoulder, it’s too small. But in either case, know that there is no fixing the shoulder seam. If a shirt fails this test, walk away. If you put on the button-up and sit down, do the buttons pull? Unless you want to stand for the rest of time, size up. How can you tell if your shirt is too long? The fastest way to find out is to raise your arms while wearing the shirt untucked. If your midriff is exposed when you raise your arms, that means your shirt is too short. If you mostly plan to wear the shirt tucked, do the test again, with your shirt tucked in. If the tails pop out from your pants when your raise your arms, your shirt is probably too short. While this is a matter of personal preference, you want to ensure your sleeves aren’t too far past the base of your thumb, or so far up your arm that it feels like you’re wearing a baseball tee. Want a professional stylist to help take the guesswork out of finding well-fitting shirts? Try out Stitch Fix Men.